In my book Industrial Poverty I diagnose the European economic crisis as being a permanent state of economic stagnation, caused by a fiscally unsustainable welfare state. The deficits that plague the continent’s welfare states are caused by a structural imbalance between tax revenue growth and growth in government spending. In other words, the deficits that the EU-IMF-ECB troika and member-state governments have been fighting so hard over the past 5-6 years are actually in large part structural. As I explain in this paper, you cannot fight structural deficits with business-cycle policy measures. That is what the Europeans have tried to do for half a decade now, to no avail. In fact, their problems have only gotten worse, with no recovery in sight. Today I am happy to report on yet another depressing angle of the crisis. A structural budget deficit is a deficit that a government cannot pay for over a long period of time. While there is no set-in-stone definition of a structural deficit, the conventional definition has been that it is the deficit that remains when the economy is operating at full employment. However, the definition of full employment changes over time; what was considered serious unemployment in the 1980s is now acceptable as full employment in many countries. With that change, obviously the definition of the structural deficit would change as well, even though government has done nothing to reduce the deficit. A better definition of a structural deficit is one that still rises above the regular business cycle but at the same time is independent of the level of employment. In the aforementioned paper I suggested a definition based on, at minimum, ten years of economic performance: a ten-year long trend in government spending (or a specific share thereof) is compared to a ten-year long trend in tax-base growth. If spending outgrows the tax base, then the government is having to deal with a structural deficit; if the tax base grows faster than spending, then there is a structural surplus in the government budget. 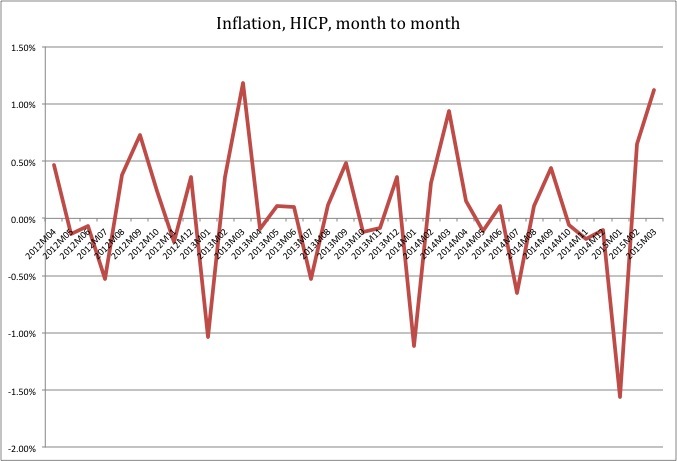 Current-price and inflation-adjusted growth in GDP. Not all member states report these numbers down to the level needed for a ten-year trend study; in addition to 13 EU member states I also pulled data for Norway, which turned out to be interesting. While the Polish government’s broadest possible tax base is growing by 120.5 euros per 100 euros of welfare-state spending, the Portuguese tax base only grows by 53 cents per euro of growth in welfare-state spending. This indicates structural deficits in ten of these 14 countries. It does not mean that there is an actual deficit of this magnitude, but it means that the economy of these ten countries is unable to sustain the spending that goes out through their entitlement programs. But that aside, it looks kind of good, doesn’t it, to have such a prominent welfare state as Sweden in the structural surplus category. Does that not mean that the welfare state can be paid for? All of a sudden, Poland can only pay for 61.8 cents of every euro they spend on welfare-state programs. Sweden cannot pay for half of its welfare state. But worst of all: welfare-state spending in Portugal and Italy is so structurally under-funded that it outgrows the tax base by more than a euro, per euro in increased spending! This means, in a nutshell, that the Portuguese and Italian governments draw taxes from a shrinking tax base to pay for what is undoubtedly an out-of-control welfare state. 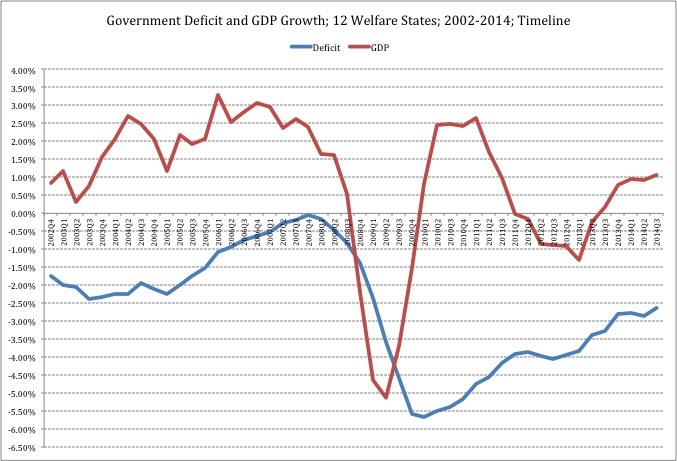 Even if the actual growth of their tax revenues does not track the growth of GDP at all times, the GDP growth rate provides the most comprehensive picture of what the economy – and thereby taxpayers – could afford in terms of welfare-state spending. The bottom line for today, therefore, is that governments of welfare states from all corners of Europe are lucky if they see their tax revenues grow half as fast as their spending. And that is regardless of where the business cycle is: again, these numbers cover the period from 2004 through 2013. As the Germans, the Greeks and the European Union leadership try to hash out a reasonable plan for Greece to secede from the currency union, the underlying question remains: has Europe managed to deal with the structural problems that brought many of its member states to their fiscal knees? More specifically: are the problems that have sent Greece into a depression and possibly out of the euro zone unique to Greece – or are they just more concentrated there than elsewhere in Europe? The answer to this question, presented in my book Industrial Poverty, is that the Greek crisis is merely a concentrate of an endemic European problem: a welfare state that is structurally and permanently too costly for the private sector to pay for. So long as the Europeans keep their welfare state they will continue to dwell in economic stagnation, with chronic problems of growth and budget deficits. Over the past year countless forecasts of a strong recovery – or even a moderate recovery – in the European economy have been proven wrong. 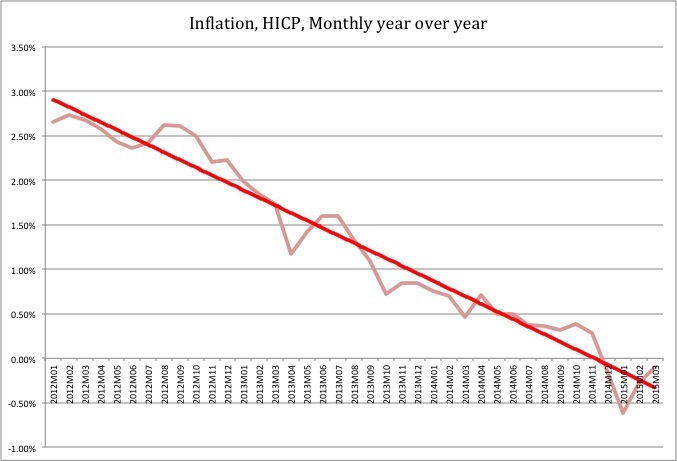 There are two reasons for this: economists normally rely on econometrics when they make their forecasts, a methodology that is not well tuned for large institutional and structural problems in the economy; and the focus on – obsession with – econometrics leads economists to ignore long-term structural trends in the economy. Europe’s crisis is a structural one, caused by a long trend of weakening growth and increasingly persistent budget deficits. The over-arching problem, again, is the structure of entitlements imposed on the economy by the welfare state, a fact that is visible in the following, rather compelling data. The better the deficit-to-GDP ratio, the stronger is GDP growth. Truth is, neither side is correct. The reason why budget surpluses, or small deficits, correlate with high growth and deficits with slow or no growth, is as simple as it is independent of political-economic theory. Put simply, modern, mature welfare states are so big and difficult to pay for that a budget deficit is the normal state of affairs. 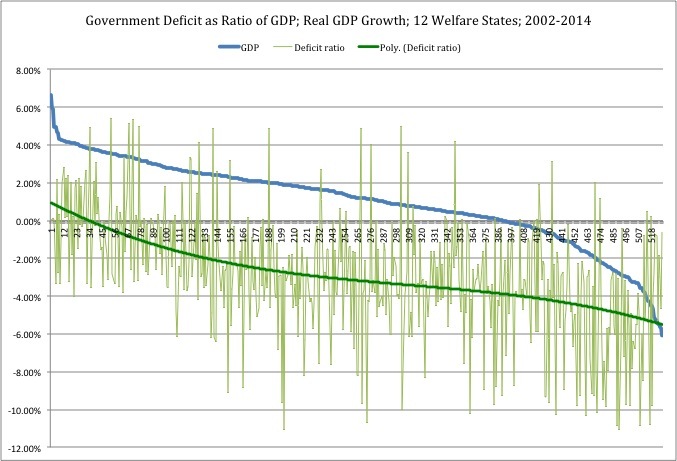 Since the welfare state also depresses growth, by means of high taxes and sloth-inducing entitlements, it creates a combination of deficits and low growth. Under unusual circumstances, high growth combines with surpluses not because government spending is low, but because GDP growth is high. In other words, observations of surpluses in Figure 1 are due entirely to a fortunate period of strong growth. Note how the deficit-to-GDP ratio improves from 2005-2006. The reason is an improvement in GDP growth that started already in 2003. Next, note how GDP growth stagnates and starts declining in 2007 and how the deficit ratio follows downward in 2008. The upturn in the deficit ratio does not come until 2010, a year after GDP started improving. In a nutshell: it is growth, not austerity, that fixes European budgets. (The same holds true, obviously, for the United States as well.) In absence of growth the budget deficits overwhelm their host economies and pile up more and more unsustainable debt. I normally do not write about momentary events, such as the daily fluctuations on the international currency market. But today’s exchange rate between the dollar and the euro, which according to Bloomberg happens to be $1.06 per euro right now, is worth a broader analysis. The trend toward euro-dollar parity has gained a fair amount of attention in the media, and rightly so: when the euro was launched a decade and a half ago it was sold as a stellar currency, backed by some kind of European integrity, and certainty way above that flimsy greenback. Reality turned out different. The euro and the dollar would have reached parity many years ago had it not been for the excessive money printing during Bernanke’s QE programs. But now that the Federal Reserve has cooled down its printing presses and the European Central Bank, on their end, have cranked up theirs, it is only logical that the two currencies are re-evaluated on the global currency market. Immediately, one could question the case for parity based on the fact that the Federal Reserve Board of Governors meet tomorrow, Wednesday and likely will throw some cold water on the surge of the dollar. However, a postponed interest-rate hike will not make much of a difference over time: while only about three percent of all short-term rate changes are related to real-sector events, long-term trends are determined by the macroeconomic performance of the two economies. From this perspective, euro-dollar parity is a historic event. Its underlying cause is a long-term, widening gap between GDP growth, consumer spending, business investments and job creation in the United States and in Europe. Our job creation record in this recovery is not exactly stellar, but our unemployment is nevertheless almost half of what it is in the euro zone. The EU as a whole is doing microscopically better than the euro zone, but that is almost entirely thanks to the comparatively positive trend in the British economy. It is important to understand the driving forces behind growth. 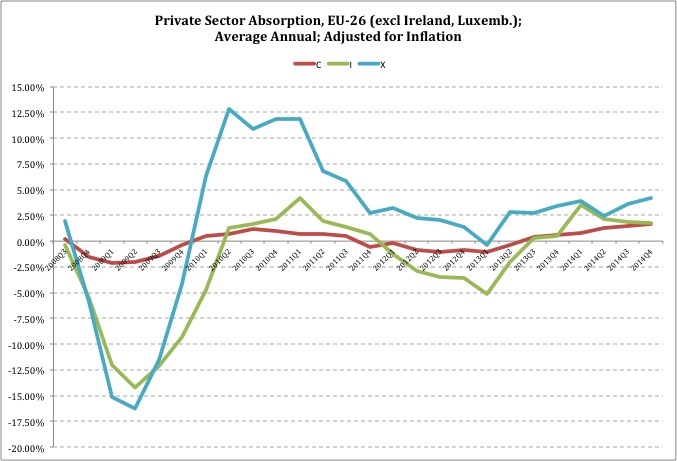 If it is private consumption and business investments, it means that the private sector is doing well. In my recent blog series “State of the U.S. Economy” I pointed to these variables as being essential to the growth of our economy. What is particularly interesting is the visibly stronger confidence in business investments. Therefore, we can safely conclude that we have a growth period in the U.S. economy that is well grounded and could last for a couple of more years. 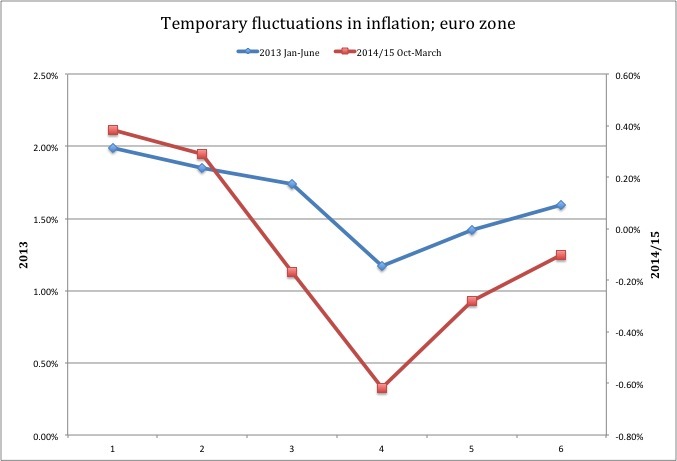 This points to a fundamental weakness in the European economy. While government has assumed more responsibilities for people’s lives in Europe than here – and as a result has a higher level of spending – it is important to understand that this does not compensate for lack of private-consumption growth. Government spending in Europe has been held back by welfare-statist austerity policies for a good six years now, which only pours more salt in the growth-stopping wounds on the European economy. For all the macroeconomic reasons reported above, Europe will not return to growth any time soon. The American economy will continue to grow at moderate rates for another couple of years, during which we will see a reversal of the exchange rate between the euro and the dollar. *) For an explanation of the two-percent growth threshold in private consumption, see my book Industrial Poverty, specifically the section about applying Okun’s Law to private consumption. The prioritisation by the EU and its Member States of economic policies at the expense of social policies during the current crisis is having a devastating impact on people – especially in the five countries worst affected – according to a new study published today by Caritas Europa. The … failure of the EU and its Member States to provide concrete support on the scale required to assist those experiencing difficulties, to protect essential public services and create employment is likely to prolong the crisis. a picture of a Europe in which social risks are increasing, social systems are being tested and individuals and families are under stress. The report strongly challenges current official attempts to suggest that the worst of the economic crisis is over. It highlights the extremely negative impact of austerity policies on the lives of vulnerable people, and reveals that many others are being driven into poverty for the first time. This was, again, two years ago. Since then, things have gotten worse, which Caritas reflects in its 2015 study of the European crisis. Sadly, the report not only accurately presents the socio-economic disaster in southern Europe, but it also makes requests for a bigger welfare state. [From] 2011, social expenditure declined … and social challenges have grown further during the second dip of the recession … for example, in a number of countries the number of long-term unemployed losing their entitlements has increased, the level or duration of benefits has been reduced, eligibility rules have been tightened to increase incentives to take up work and this has also led to excluding beneficiaries from some [entitlement programs]. [The] policy of requiring countries with the weakest social protection systems to impose fiscal consolidation and successive rounds of austerity measures within very short timetables is placing the burden of adjustments on the shoulders of those who did not create the crisis in Europe and are least able to bear the burden. This is the problem facing Europe in the next few years. An economic crisis hit; governments responded by slashing welfare-state entitlements and raising taxes; people respond by getting angry – not over the crisis, but over lost entitlements. As a result, socialist parties are gaining strength from Paris to Lisbon, from Athens to Madrid, pushing an agenda of restored entitlements. Caritas reinforces this movement by suggesting that “social justice” – a politically undefinable concept – should be the guideline for post-austerity policy. A battle cry for more social justice is a battle cry for higher taxes and more income redistribution. Or, as Caritas puts it, “the impacts [of austerity] have not been shouldered equally”. If by “equally” they mean “spread out evenly across the citizenry”, then yes, they are entirely correct. But the reason for this is – obviously – that only a select segment of the population receives entitlements from the welfare state. That is the very reason for the welfare state’s existence. Caritas and other advocates of social justice would respond that this is a moot point: those who earn the least cannot afford lose the entitlements they have. Others have money, they contend. If the argument about the frugality of welfare-state entitlements were applied to the United States, it would not stand up to scrutiny. Michael Tanner and Charles Hughes have proven this beyond the shadow of a doubt. Things are a bit different in Europe, though, as Caritas actually show in their study. However, this does not mean that austerity could have been executed differently. More burden on those who do not receive entitlements automatically means higher taxes; as I show in my book Industrial Poverty austerity based on tax increases has even worse macroeconomic effects than austerity biased toward spending cuts. This means, in a nutshell, that if austerity had been profiled according to some “social justice” scale, it would have deprived even more Europeans of jobs and entrepreneurial opportunities. Plain and simple: Europe must not fall for the temptation of “social justice”. It must charter a course away from collectivism and government “solutions”. The way to the future goes through fundamental, structural reforms toward a permanently smaller government.